Good afternoon, BB addicts! Welcome to the afternoon post. So, as y'all probably already read in the The Overnighter, Elissa wants to save Amanda and work with Amanda/McCrae for Final 3. (Amanda wants Final 4 with them + Andy), but it's not gonna happen. Andy will not be voting for Amanda to stay and in fact, will let Elissa vote for Amanda and then Andy plans on framing Elissa by saying that he did vote for Amanda to stay but Elissa did not. If there's one thing that has come out of all of this, it's that Elissa will now be the #1 target after Amanda leaves on Thursday. (Spencer/Andy already had Elissa as their #1 target, while GM/Judd had McCrae as theirs, before everything that happened last night). There were 2 convos that I didn't get to cover in the Overnighter that I think is important to watch (thanks for the comments in the comment section! ): (1) Elissa/McCrae talked at 8:30pm BBT until almost 9:30pm BBT. (2) Amanda/Elissa at 10:23pm BBT. McCrae told Elissa that after Amanda leaves, he's gonna be a 'free agent' in the game and mentioned that he doesn't have friends in the jury house, except for Amanda. Elissa doesn't think anyone would vote for her (El) to win in Final 2. The both agree that Judd/Andy have a lot of friends in jury, though. Elissa mentioned that she's nervous about the Double Eviction (*all HG's are guessing there's one, but not sure). McCrae said he'd have good reasons to put up Elissa/GM together if he won HOH. Both agree that Andy will be dangerous in upcoming comps because he knows the days of BB events, etc. McCrae also mentioned about how GM's foot is messed up (she broke a toe) from falling down the stairs a few days ago. Elissa kept saying how she (Elissa) wouldn't win in Final 2 and might have 1 vote from Helen, but that's it. They both mended fences with each other, both appologizing for everything that's happened. A new slate for the both of them. Amanda told Elissa that keeping her there would keep her (El) safe through the double eviction on Thursday, acting as shield for her. Elissa said that GM/Judd would be mad at her (E) if she tried to keep Amanda. Amanda suggested to blame the vote on Judd. She said that she/McCrae/Andy/Elissa could work together and that she (A) would continue to be the target if left in the game. Amanda also apologized to Elissa for everything she's done. Amanda also warned Elissa that after she (A) leaves, everyone will be gunning for her (E). After this convo, Elissa talked to Andy and Andy told her to not listen to Amanda. Later on, Elissa got called to the Diary Room and I think after they asked her questions, such as "What do you think about that?" and "Could you trust them? ", and stuff like that, it got her thinking that maybe it might be a good idea that Amanda presented her with keeping her in the house and thus protecting herself (E) in the game. GM is in the D.R. All other HG's are sleeping still. 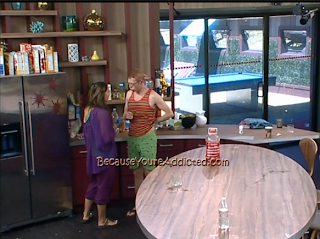 Elissa is in the kitchen with Andy. Elissa is telling Andy that it's a good move for them to keep Amanda because Amanda/McCrae will be bigger targets and keep them safer, longer. Elissa also mentioned that Judd had said how everyone in jury loves Andy and he wouldn't want to take him to Final 2 because he wouldn't win over him. Andy walks away saying "Yea, I'll do it." but he's lying. Andy goes into the bathroom. Elissa continues to make some coffee. Elissa is alone on the backyard couch. She already did her HOH blog. She said it went a lot better than the last time she was HOH. Andy takes a pic of her in her HOH robe, then she goes off to take pics of confetti on the floor in the living room. BB: "This is a lockdown. Please go inside..."
Elissa is taking pics of GM with her HOH camera. Everyone except for Andy/Elissa/GM are still sleeping. Andy is still taking pics of GM. Elissa is listening to GM's CD. Judd was just called to the D.R. The Exterminators (minus Spencer, who is in the shower) take a pic together. Judd warns GM to be a "camera hog" today so that Amanda or Elissa don't see that pic. Elissa & Amanda give each other collateral to prove that they're sincere in working with each other and that Elissa is 100% sincere in keeping her this week. Amanda gave Elissa gold earrings, as Elissa gave Amanda her one of her wedding bands. Meanwhile, the Exterminators just got done taking a pic together in the HOH room. They also go over the plan to get Amanda out, 100%. Andy: "Elissa or McCrae cannot win (HOH)! I'm gonna be act appalled when the vote comes out..."
Spencer: "And I'll pretend to be mad at you." 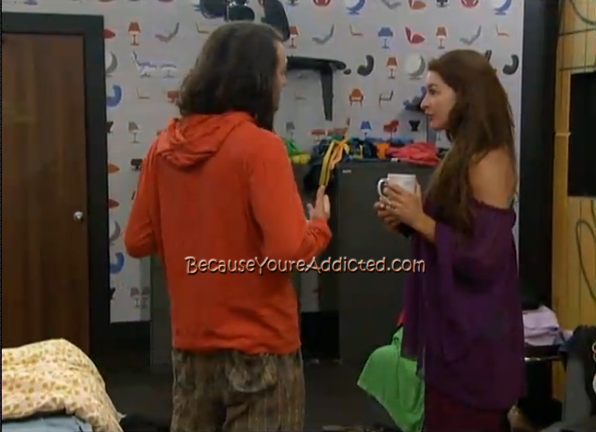 McCrae/Amanda are talking about the upcoming double eviction. McCrae is telling Elissa that Andy is worried that Elissa is setting him up & he's just nervous. Amanda/McCrae/Judd/Andy are talking about the Olympics. Elissa is in the back bedroom doing yoga. Spencer is now in the kitchen with Mc/Am/Andy/Judd. 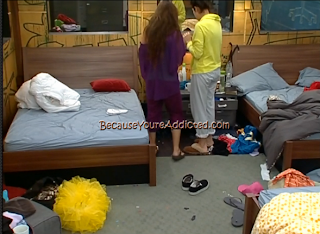 Amanda shows Andy the ring that Elissa gave her as collateral. Andy: "I'm just worried that the votes (won't be there) and then I'm f**cked!" Andy (again lies to her) and says he's on board. They hug & leave the Have Nots room. 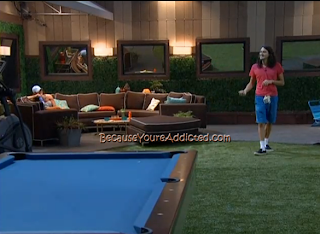 McCrae/Andy/Amanda/Spencer/Judd/GM are in the kitchen, wondering why they're on inside lockdown. Andy: "Maybe it's another luxury comp since Spencer messed up the 1st one." Judd: "I can't keep Amanda here. She would deserve to win. But McCrae, he's not that bad." Elissa said she's nervous that Judd would put her up on the block if he won HOH. He says he wouldn't. Elissa continues to do her yoga. ***Just to clarify: Elissa TRULY wants to save Amanda and work with Amanda/McCrae. They think Andy is on board, but he is 100% not. The Exterminators Alliance (GM/Andy/Judd/Spencer) know of the plan to try to save Amanda but are still voting her out. Amanda will still leave on Thursday as of now. Elissa/McCrae/Amanda are talking about shocked Spencer is gonna be when "he gets evicted" on Thursday. Judd/Spencer/Andy are talking. Andy said he's already planted the seed to McCrae that he's "worried" that Elissa will flip and frame him with the votes. Judd: "What if when Amanda gets evicted this Thursday, and she walks out with Elissa's wedding ring, Elissa goes crazy and self-evicts?" Andy: "We NEED to WIN (HOH)!" Andy is pretending he's still on board with Amanda. why did GM go into her HOH room and yell YAY!!!!!!???? I wonder if Elissa will have another miracle DR epiphany today or tomorrow where she suddenly realizes Andy is a rat who can't be trusted and she needs to start working on GM to be the tie breaker vote to keep Amanda because the guys have just been sitting back and encouraging the girls to cannibalize each other. And that if GM thinks she won't be next after Amanda and herself she's in for a rude awakening. Just really hard sell that's it's The Moving Company Reunion Tour and they may have replaced a couple of the original band members but they're still performing the same act and singing the same old tunes. Now I don't know if it'll work but it's certainly got more legs than the Andy route right now. If they really want this to work then DR need to hear it to Andy that Spencer Judd and GM I'm not being loyal, so he will then vote with E and Mc. Andy is my least favorite player but they need to let him know in the Dr that if you want to try to make it to the final two that he needs to go with Am E and Mc. How many times does Elissa have to realize Andy is a rat? I hope she leaves next. What a idiot! I guess the brains went to Rachel. Rachel must be home face planting herself constantly over what E has done. I wouldn't count out Amanda staying so quickly. It is only Tuesday. That ring Elissa gave Amanda is going to blow up Andy's "frame Elissa plan" -the entire house knows how Elissa is with her fancy possessions. Amanda is wary of Andy, she is figuring him out. Andy is about to be exposed to the entire house before Thursday whether Amanda goes or not. I don't believe for a second that Andy's plan to frame Elissa is going to work. Elissa would have absolutely no reason to go thru all this trouble to lull Amanda into a false sense of security just to send her home. Plus she forked over one of her wedding bands. Andy on the other hand has every reason to agree to Elissa's plan and then go against it. Surely McCranda will see that and it's foolish for Andy to think he's going to be believed. The plan works for me though - Amanda will still go and McCrae will be super pissed at Andy. So on the off chance M wins HoH he will target Andy. I do see Elissa's point of wanting to keep bigger targets in the house to protect herself but I am still shocked she has done such a 180. Ah well...I am still team Elissa!! I kind of agree about Andy's plan backfiring. But, I would argue that Amanda really thinks that he is so blindly loyal to Mc/Am that he (andy) wouldn't go against them. All week she has been convinced that he is their biggest ally, even though it appears to be obvious (at least to the outside observers haha) that he isn't. I don't think its a great plan, but I can also see it working too. Why did Andy say Spencer messed up the last luxury comp? Was he just joking? Amanda was right to think "it doesn't make sense" that GM would not put up Elissa. Amanda needs to go back and figure out why it is so important for "the house" to get her out. Between what she knows and what Elissa knows, they should be able to figure out that the "exterminators" are working together. The fact that Andy always has to run and tell should been seen as the person who is the weakest link and guarantee him a ticket home if the vote comes out wrong. It's time to turn up the heat. I don't think that even Elissa could convince GM of the truth that the boys are working together and GM would not make it to the F3 or F4. AEM could also try to threaten GM the same way they could threaten Andy. If Elissa or McCrae wins HOH, GM and Andy go on the block and one of them will go home, possibly this week. Just the threat should "bust" the exterminators. I would love to see Amanda and Elissa confront, interrogate and threaten Andy. Then they could the same to GM as a measure of safety. I think Andy and GM would be making many trips to the bathroom and once word got back to Judd and Spencer, the bathroom would be overflowing, LOL. I would say putting up a wedding band is about as good as collateral gets for someone who is such "a good person". I wouldn't count on Andy's plan not working. McCrae would be the one staying and he's completely snowed by Andy which is the reason they made the huge mistake by keeping him over Aryan last week. In a hectic DE I think it'd be easier to believe the girl who's been feuding with Amanda for weeks lied just to mess with her than the guy who's been with you the whole game. That's why it'd be better if Elissa won HOH so she could try to prove herself to McCrae by not putting him up. If McCrae wins HOH I could definitely see him falling for it in all the chaos and targeting Elissa. Definitely shocked Elissa put all the personal stuff aside for this game move. When I went to bed last night after Amanda's pitch to Elissa and her subsequent dismissal of it alone with Andy I was expecting to be criticising her today for missing a potential opportunity in the game for personal reasons. And was pleased this morning when I saw she had changed her mind, however that happened (cough DR cough). Even though it's not gonna work it was still a worthwhile gamble and the right move for her as she was gonna be behind the 8 ball anyway. I mean she went from being #1a on 3 people's hitlists and #1b on 2 other people's hitlists to being #1a on 4 people's hitlists and potentially having an ally in McCrae if he doesn't fall for Andy's lie. Ok, I have only posted on the wonderful blog a few times (thank you Jamie btw) but i just can't keep quiet anymore. I saw After Dark last night and watched as Amanda spilled the beans to Elissa about how everyone wants her gone next, and basically promised her (Elissa) her first born. I just knew that this would have fallen on deaf ears. Elissa and Amanda in an alliance, no f@&%ing way!!!!! WTF is Elissa thinking?!?! Has Elissa drunk too much spoiled wine or what?? And Andy, aka gollum (lol)is all over the place with his nosy self. He doesnt even have the balls to vote Amanda out without blaming it on Elissa, which I think Mccrae will realize that it was his vote, and NOT Elissa who voted Amanda out. And is Amanda that flipping crazy that her last resort was to go to Elissa of all people?? And for Elissa to actually BELIEVE her desperate pleas? Especially since Elissa doesn't trust Andy (and rightfully so), why in God's green earth does she trust him now and want a final 4 deal?? I can see all of these houseguests losing their ever-loving minds and switching alliances by the hour. Im so lost and confused I have no idea who is really with who, what, where when...etc. I am speechless!!!!!! As much as I hate to admit it, Andy flipping may be the best move he could make, reducing the odds of becoming a target. If he flipped, he would anger Judd and GM. GM can not play for HoH in the second eviction. Judd would be the only Exterminator playing for it. If he goes forward with the Exterminator's plan and votes out Amanda in the first eviction, he will become a target of both McCrea and Ellissa. They have a good shot of winning HoH and putting him on the block with, most likely, GM. If he doesn't win PoV, he is going home. In a situation where he flips and keeps Amanda, going forward, he would still be less of a threat than A/M, even though he abandoned the exterminators alliance. If he stays true to his alliance, I have a feeling Andy will be going home in the second eviction. Opinions? If there's one positive quality Amanda has shown it's loyalty. I believe if Elissa had stuck her neck out to save Amanda from the brink of certain eviction she'd have kept her word to Elissa for as long as possible. Elissa's distrust in Andy has always been in terms that he was still working with Amanda and McCrae 1st and foremost when she wasn't so she'd have much more faith in him in an alliance involving Amanda and McCrae. Unfortunately for her, Amanda and McCrae she's wrong. Andy re-flipping back to Amanda and McCrae with Elissa could increase his safety short term with the DE. But I think his plan to pin it on Elissa backing out with McCrae has a very good shot of working so it could just be Elissa he has to fear winning HOH. However more importantly Andy is looking longterm here and has eyes on winning the game. Now ask yourself who would you rather be competing with in comps and in potential F2 opponents in choosing between a F4 with Amanda, McCrae and Elissa or Spencer, Judd and GM? I know if it were me and I wanted to win I'd certainly much rather be in a house with that 2nd bunch of losers. I can't believe that E is really trying to save A!! I really don't think she's really "safe" either way, but saving A against everyone else's wishes is just crazy. Everyone but mcC will def be gunning for her asap. I think she would have possibly got GM & Judd to work with her if she voted Amanda out.. Can't wait until Thur! If Mccrae doesn't realize that Andy was the vote to send his crazybutt gf to the jury, after Elissa gave her her wedding band, he is truly as stupid as he looks. While I'm still not sure how I feel about this new mc/e/am alliance ( even with Amanda going home anyway) it is definitely some good tv. I know ill need a xanxax and a drink watching the drama unfold on Thursday!! @Brian, I agree, as much as I despise crazy Amanda, she has been loyal, however, if it turned out that she stayed, I feel like Amanda would turn on Elissa for the simple fact that she HATES her with a passion. But then again, with the exchange of jewelry(lol) Amanda may have somewhat redeemed herself....just a very very very small redemption......very. I am still doubtful Andy's plan will work. I guess we will see. If it does work, you're analysis is spot on. If it doesn't, I am betting we say bye to Andy. I doubt Elissa would have done this, but one trick that any HG can always use is to wear a couple of pieces of jewelry that supposedly have "sentimental value" to the wearer but are really just baubles. They might be real gold, for instance, but not have any personal significance other than, "I bought this at Macy's to wear on BB." Then you can freely give an item at a truly crucial moment in game play to convince a houseguest of your sincerity. But knowing Elissa, it's probably not the actual wedding band but a band that holds her engagement ring. My grandmother wore 4 rings back before "ring jackets" were hip. One was the wedding band, then a band, then the engagement ring, then another band. So that's probably what Elissa gave to Amanda. Elissa making a deal with Amanda, McCrae and Andy is not only a good option for her, but her only option. As far as I know, her and the others are currently against Amanda and McCrae and I believe Elissa has a Final 2 deal with GM and Judd. But I think she realizes she is not included in any real alliance. She has figured out she stands a much better chance of the Jury voting for her over Amanda and McCrae. I'am not sure how Andy got involved in this hopeful alliance, as I thought she didn't trust him, but none the less, she is trying and thinking about game. Because really if no one is talking game with you and your not in the in, then your in the out, when it comes to Big Brother. I think it would have a greater chance of working if he hadn't showed his cards by already saying she's trying to frame him. E has a strong stance by giving her wedding ring although even Amanda would give it back altho she might walk out the house with it. Thurs should be. Must see TV. Too bad for CBS that all this is happening after the veto ceremony so they're only going to be able to show a fraction of this at the beginning of Thurs show, esp with a double eviction. I'm new to reading BB blogs, and this is by far the best one I've found! Jamie you are so amazing. Anyway. Remember when Andy was saying that he wanted to vote for Amanda to save face with McRae, and also told GM that way she could be the one who had the tying vote and could have the satisfaction of sending her home personally? Why didn't A/M/E keep their newly formed alliance a secret and Elissa's vote would have saved Amanda without anyone knowing before it happened! Hellooooo? Zingbot is the MVP this season. Stupid off topic question. Does it ever rain? Elissa & Amanda.....who would ever have thought these 2 would be on the same side?! I still believe Amanda will be going home, unless McCrae can somehow convince GM that she will be 4th in an otherwise all-male alliance. GM 'hates' (is super jealous of) Elissa & Amanda's new relationship, so it's doubtful she'll flip, although she'll be sorry she didn't on Thursday! I cannot believe that Andy, Spencer, Judd and GM may make F4; what a bunch of knuckleheads! Andy is the only one who really played the game; the 3 others were just lucky to have slipped through the other 'real' players who basically picked one another off. Hoping McCrae brings it on tomorrow and puts up GM & ______(Spencer/Judd) if Amanda goes. I'm sure the jury house will love to see Amanda walk in followed by GM! We will see! I'm still rooting for an Andy/McCrae F2!!!!! I'm starting to believe that BB is fixed. With the rampant rumors that Amanda knows a mucketymuck w/in BB there is no other explanation for what is happening with Elissa. And there never was another explanation for Amanda's crazy behavior. And one minute GM is my very unlikely hero for having a (the ONLY) set on her ( A&M noms )and then she gets all derogatory about Elissa's child. What the? JU double D is the only one that doesn't seem mentally & emotionally damaged in some way. (Helen was good too, but that no longer matters). Guess I should go watch Sesame Street or Mr Rogers because I don't like what this is doing to my own integrity as I cannot wait for the blonds to find out they are being held accountable for their behavior and are losing their jobs. Watching as Aaryn almost tried to deny on live tv her own racial slurs till her blondness remembered oh yeah they tape this, was very telling. I actually think she will grow out of this. Amanda is a different story. If she doesn't leave this week I'm done. D.O.N.E. No offense, I hope you are wrong about Andy's plan working. I am so tired of Andy being so disloyal. He has been on this slippery slope since the beginning and these fools can't seem to figure it out! It's makibg me crazy! Because they told Andy, thinking he wad still in there alliance, but then he ran back and told everyone else in the house, just like the big rat he is. No offense taken at all as so do I actually. I was simply replying to others saying there was no way it would work and pointing out that it wasn't the most ludicrous concept that it could in fact work. You should know, I realize you are always the voice of "reason" on this blog. I can always count on you to give me another perspective I have not thought of. I guess it's just that because I thought Elissa was so suspicious of Andy, I figured she would have at least put the option of a secret out there. It would have been an amazing bombshell for the ratings at least lol.